How Much Does a Modern Conservatory Cost? How Much Does a Modern Conservatory Cost? 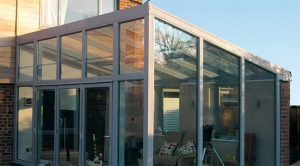 There can be various types of a modern conservatory and all of these types could be built as an independent structure or as an extension to existing house. In reality, almost 100% of the time, they are built as an extension since that adds more space to the interior of the house and increases the square footage. As a result of the increase in square footage alone, the re-sale value of your home will also increase. What is a modern conservatory? A modern conservatory can be thought of, and designed, in many ways, but our idea is that a modern conservatory should feature clean lines and lots of glass with minimal ornamentation. However, if you are a lover of fancy detailing and ornamental design, then it’s probably better for you to consider period conservatory designs that display these key features, such as a Victorian or Edwardian. 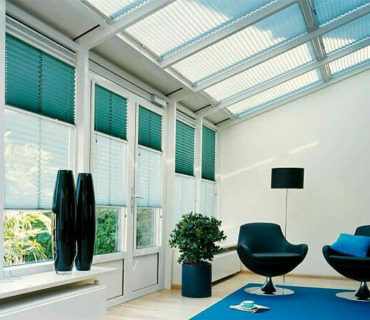 An important aspect is certainly the materials to choose for the frame of the conservatory. It can be a conventional wooden structure, high spec aluminium or even uPVC, but each material gives a totally different character to the room. In our opinion, the next most important aspect to consider is the amount of glass to be used. 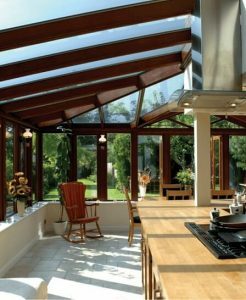 A true conservatory, at its beginnings, was created to allow large amounts of natural light in the interior. 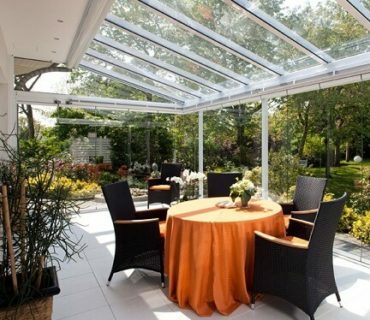 Subsequently, fully glass sides and roofing should be a big feature element of any modern conservatory design. What design is best suited as a modern conservatory? Some of the more striking contemporary designs make great use of the Lean-to, Loggia, Georgian, Gable and Pavilion styles. 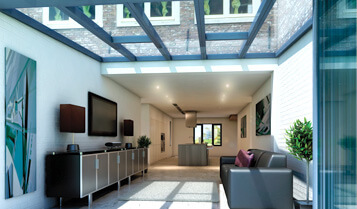 Lean-to conservatories, in particular, have been the basis for some very handsome home extensions. Many of the very latest designs are combinations of one or more styles combined into new shapes and have, in some cases, successfully merged full glass sides with a solid flat roof that has raised glass sections or large skylights to maintain high levels of natural light. Another feature becoming popular for modern conservatories is the appearance of what can be referred to as a “Veranda conservatory”. This is where one or more of the roofing sections is extended beyond the sides of the room to create an overhanging veranda, which is completely open sided but offers overhead protection from the weather. You may also find that modern conservatories feature more use of darker colours, with many owners having gone for slate-grey, black, very dark blue/black. This seems to give the conservatory a much bigger visual contrast and “impact”. A growing number of modern conservatories feature floor to ceiling full glass sides that are actually movable. This is probably as a result of the rise in popularity of the bi-fold door. There are designs where two adjoining sides completely fold back and leave the roof section appear to simply “float in mid-air”. But, you don’t have to go overboard to get a new look and have a modern conservatory of your own. We mentioned beforehand that Lean-to conservatories are a favourite candidate for this type of room. You can make your lean-to have a super-contemporary look just by changing the slope of the roof. A typical lean-to conservatory roof is one-sided and slopes away from the adjoining property wall, but by rotating that slope by 90 or 180 degrees in order to make the roof slope towards the property or from left to right, the “traditional” instantly transforms into the “contemporary”. This simple idea has minimal impact on the overall cost of the conservatory itself, but maximum impact on the appearance. Of late, architects and designers are really “stepping up” with conservatory design ideas and, in keeping with a “less-is-more” approach, this has created a niche for the “Glass Box” or full glass conservatory. When we say glass box, we literally mean a glass box. The very latest can be totally “frame-less” and even the roof supports are glass, made from high strength laminated glass sections. So, how much does a modern conservatory cost? If you are looking at one of the glass box type rooms, then it is going to be a bespoke project needing careful design and installation. This is likely to mean that the price is going to be at the upper end of the spectrum and be starting in the region of £20, 000 to £25,000. 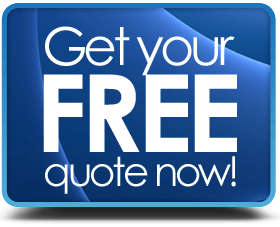 With prices for a 4000 mm x 3000 mm bespoke glass box conservatory prices easily getting into the £40,000 to £50,000 bracket quite quickly. You can see more conservatory price guides here. Having a modern conservatory does not necessarily mean that you have to spend a small fortune on some “space-age futuristic” work of art. Just a few tweaks in the design of a traditional conservatory can make a significant difference. Modern conservatories are not just about the look, they are also about being up to date on design aspects such as high levels of energy efficiency and being able to enjoy the room at any time of the year. 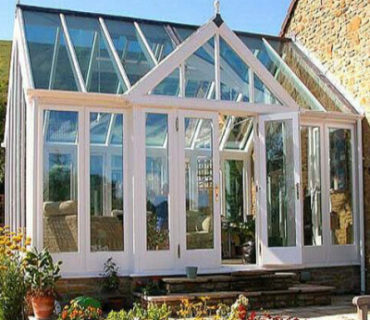 Old fashioned conservatories are too hot or too cold and can waste large amounts of your money in the pursuit of making them habitable for more than a few weeks per year when the weather is “just right”.